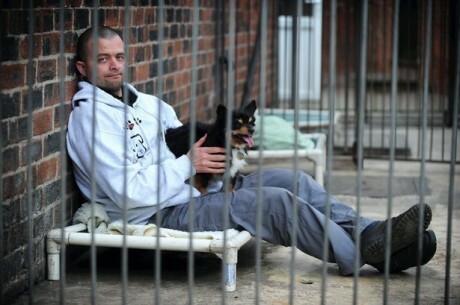 An activist in Manchester, England, Sean Le Vegan (yep), is going to take on quite a feat — sleeping in a kennel for 35 days to raise awareness about the hideous plight of homeless dogs, and to encourage people to adopt rather than buy. We’ve talked before about activists locking themselves in cages in order to raise awareness about confined animals (like dogs on death row in “shelters,” and “fur animals” trapped in leg-hold traps, or hens in battery cages, which we discussed with artist and doughnut maker Dan Dunbar on Episode 68 of the podcast). I love the theatricality of it, and agree with the activists that this kind of performance art, when strategized well, can indeed make some hay. Sean, a web designer, will be making the most of this opportunity by truly living a homeless dog’s life for a full 35 days. 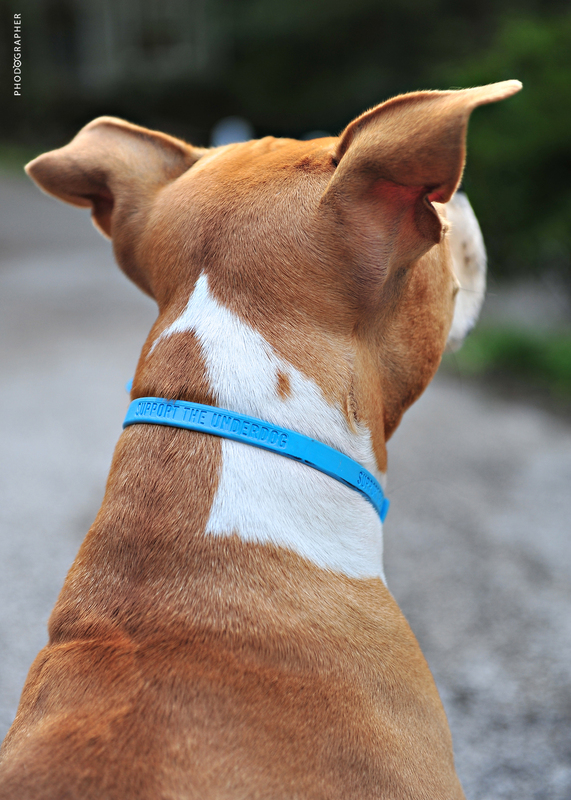 He’s even gone so far as to implant a microchip into his shoulder, which, according to Machester Evening News, is hooked up to the dog-care database. 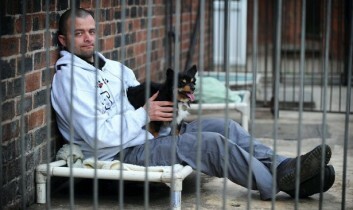 Sean’s month of hell — which is, of course, par for the course for the countless dogs who are left homeless, only 35 percent of whom at Manchester and Cheshire Dogs’ Home will wind up re-homed — will be filmed by CCTV cameras when it begins in October. In a brilliant fundraising move, people will be able to watch Sean’s challenge unfold live for a modest fee, and those funds will be donated to the shelter. You can keep track of Sean’s adventures on his website, Kennel 35. 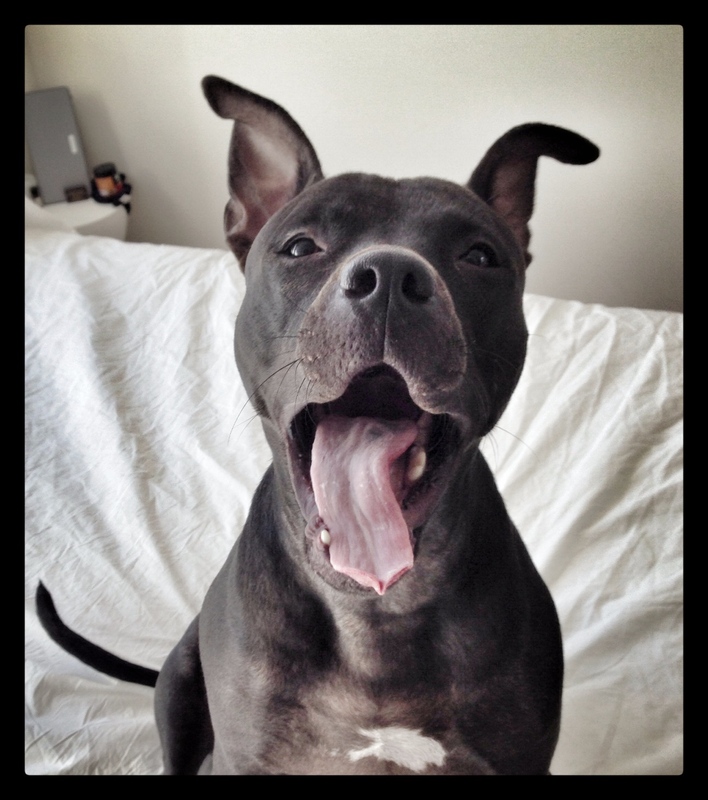 If I still lived in Manchester I'd be down at that shelter to take him and his new dog friends for a walk. This is a great fundraising and awareness raising idea! What a guy. I'll make a donation. My husband is microchipped, too. We own an animal hospital and he did it to show clients how much faith we have that it's a good thing to do. When they ask about chipping, he whips out the reader and shows them his chip!